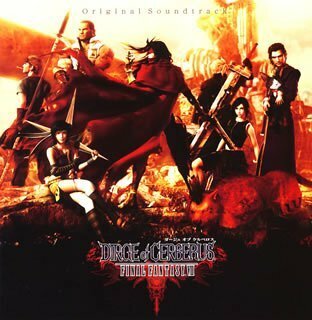 The soundtrack of Dirge of Cerberus: Final Fantasy VII contains 2 discs with a total of 53 tracks. The music has been composed, arranged and produced by Masashi Hamauzu. 04 Prologue of "DIRGE of CERBERUS"
09 Fight Tune "Arms of Shinra"
15 Fight Tune "Girl Named Shelke"
16 Fight Tune "Killing One Another"
03 Fight Tune "Crimson Impact"
11 Fight Tune "Messenger of the Dark"
13 Fight Tune "The Immaculate"